If one is compiling a list of the most beautiful aircraft to have ever flown, the Lockheed Constellation would have to be right up there. Never mind that the folks doing the box top can't spell as it isn't called the Consolation; SHEESH! Anyway, this aircraft was initially designed in the early 1940 as an airliner, though with the war going on, the first ones were military transports and designated C-89s. The early Connie's were beauties as well and served on medium-long range runs. 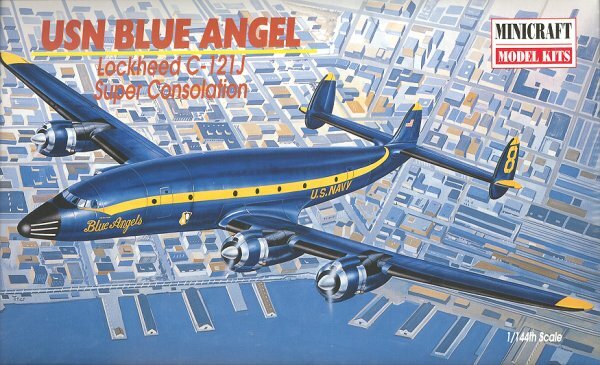 The need for an ever longer ranged aircraft was met by the Super Constellation or C-121. This airframe was also widely used by the military as the EC-121 Warning Star and also used as a passenger/troop transport. These planes were not removed from military service until the mid 1970s. Your editor worked on C-121J and EC-121Ms when assigned to VQ-1, though they were soon replaced by equivalent P-3s, a much less comfortable plane to ride in! Though most of them are gone, they are still beautiful planes and thankfully, several are now being operated on the warbird circuit. Minicraft is the darling of airliner modelers. They have committed themselves to providing what has been missing from the shelves for many years and have done a rather good job of it. They have issued a B.377 Stratocruiser, DC-6 and other propliners as well as the usual jetliners. 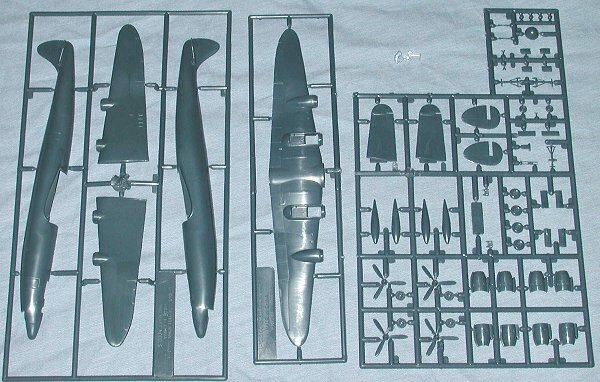 Some of the early kits were, well, less than perfect, though they could be made into nice models. This one is somewhat newer so more was expected. The kit itself is well molded and flash free. It is also in a dark blue plastic, which I could have easily done without! Overall detailing is fairly good, though a bit 'soft'. There is little detail on the wings or fuselage other than door, aileron/flap lines and nose cone. The engines are little more than representations, though in this scale, that isn't really that bad as the Connie's engines were close cowled. There are two options. One of them is for a shorter nose and the other is for tip tanks. You can build it with gear up, though that is not shown in the instructions nor is there a stand provided. The instructions are well done and show you any important paint requirements. Nothing fancy, but more than adequate to build the kit. 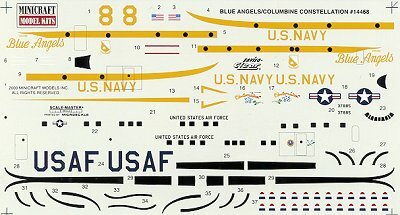 All the paint information gives FS numbers where they are required. You have decal options. One is for the Blue Angels 'trash hauler' as shown on the box art. This is in Blue Angel Blue (FS 15050) and Yellow (FS 13655). The other is for a VC-121E, 'Columbine III', which Dwight Eisenhower's presidential aircraft. This aircraft is in highly polished bare metal with FS 16473 ADC Grey areas around the engine nacelles and exhaust. The decals that come with the kit are well printed by Microscale. There are some areas of the Blue Angels plane that have to be painted. This may cause a problem as yellow is historically difficult enough to make opaque so you will get some bleed-through of the dark blue as shown on the build-up on the side of the box. The 'fix' is to put on a second set of decals, but this will require you to either find a friend who is not using those or begging Minicraft for a second set. No matter if you choose the kit schemes or go the aftermarket route, this will make up into a very nice model.